Our students outgrew the original library, one of the first buildings at Nianjema. The library is important. Students rely on the library to study and work together and, for many, it is the first time they have free access to a variety of books. To accommodate increased usage by students and teachers and the growing collection, Nianjema built a new library building and collection, including a 4,000 book gift from The Sir Emeka Offor Foundation. 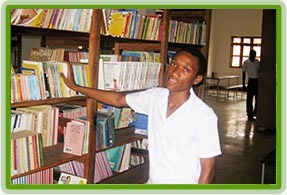 The Nianjema library, with more than 15,000 volumes, now houses more books than any other school in Tanzania.